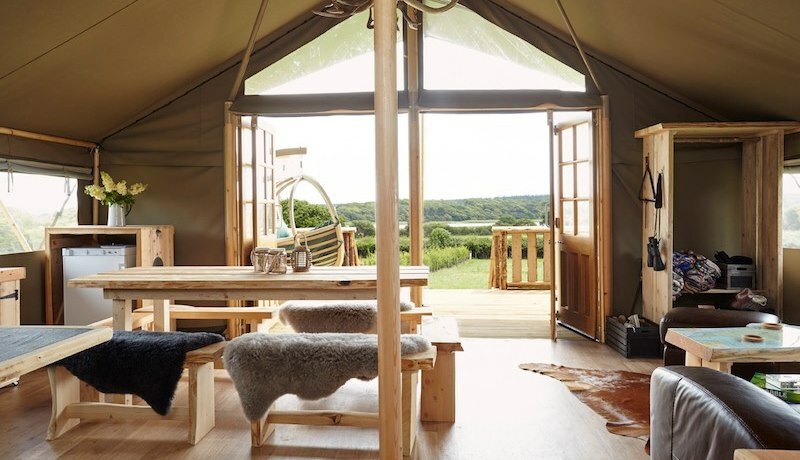 Going off grid and escaping the hustle and bustle of every day life sounds like a dream, but can be a reality in one of these 4 fantastic safari tents on the Isle of Wight! 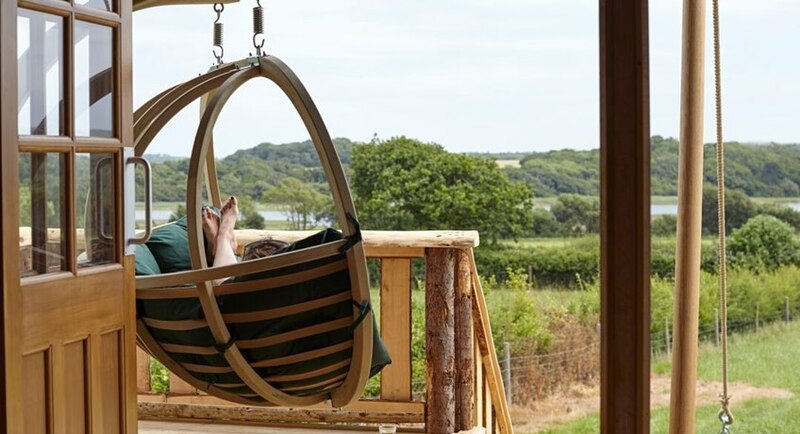 Glamping the Wight Way knows how to take you gently off grid and into a whole new world. 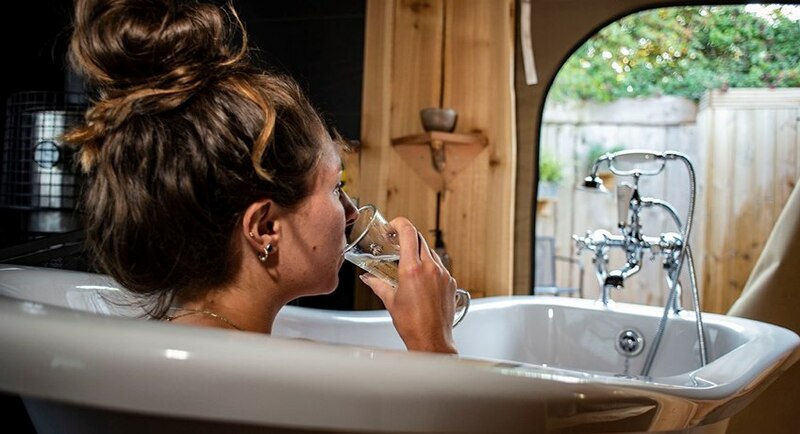 Superb introductory offer from Glamping the Wight Way!! 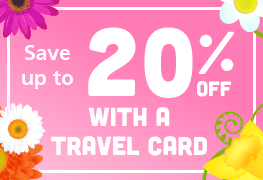 Stay an extra day for FREE!! 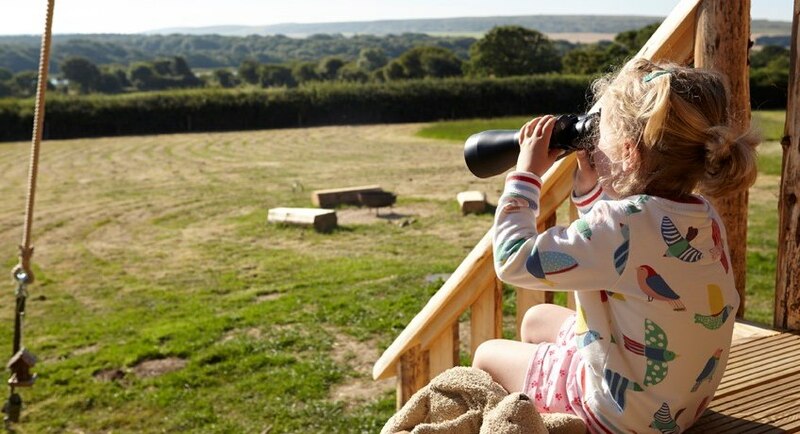 Glamping the Wight Way are delighted to offer you an extra long weekend of 4 nights for the price of 3 over the May Bank Holidays! Sleep 6 walkers in adult sized bunks or twin beds. 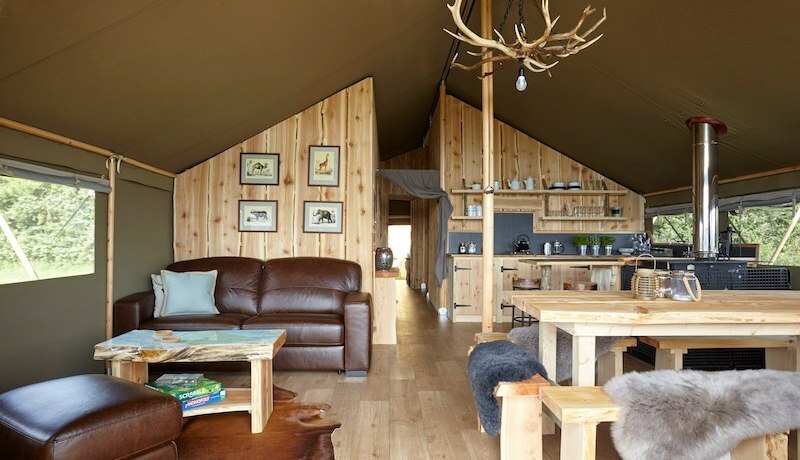 Each spacious tent offers 2 toilets, hot water bottles, deep bath & hot outdoor shower. Not 1 but 2 wood burners for evenly balanced warmth. Well-equipped, spacious & comfortable self-contained accommodation. 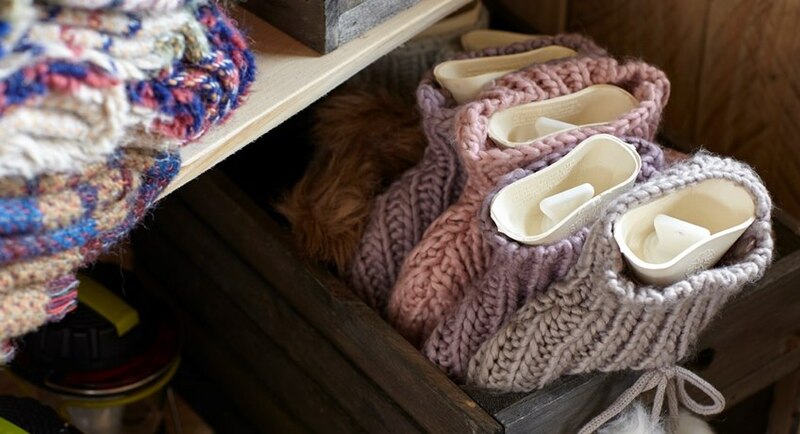 All wood, towels, bedding & blankets included. USB charging. Complimentary Recovery Pack Per Walker (Muscle rub, Blister Plasters & Energy Bar). Hot Beverages & Toiletries. 3 - 7 May (Fri-Tue - 4 nights) - £735 between the group. 7 - 10 May (Tue-Fri - 3 nights) - £535 between the group. 10 - 13 May (Fri-Mon - 3 nights) - £625 between the group. 13 - 17 May (Mon-Fri - 4 nights) - £545 between the group. 17 - 20 May (Fri-Mon- 3 nights) - £625 between the group. To book: Please enter your preferred dates below and the appropriate rate will be shown. 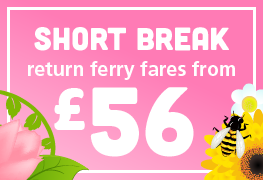 These offer applies to new bookings only and are subject to availability. Dreaming of escaping to the countryside and going off grid to relax and breathe in the fresh Island air? Then Glamping the Wight Way is the destination for you. Four incredible eco safari tents await you surrounded by rolling hills, each one fully equipped for a luxurious and calming glamping experience. Imagine waking to a beautiful sunrise pouring in through the bi-folding doors, a gentle mist hovering over the nearby River Yar, and the sound of birds soaring above you. By night as the stars close in, enjoy an atmospheric supper around the campfire, each safari tent has its own Kadai fire pit for you to enjoy. Make those family memories of toasting marshmallows on the fire, running barefoot through the meadows full of buttercups and enjoying everything nature has to offer, whilst going gently off grid. These four glamourous safari tents stand within private interlocking meadows. They sleep 6-8 people across 3 bedrooms and a sofa bed in the living area. Two king size bedrooms, and an adult size bunk beds allow for flexible sleeping, one of the double beds can be made a twin. For the chillier nights there are two separate wood burners in each tent, a wood burner water heater in the bathroom. 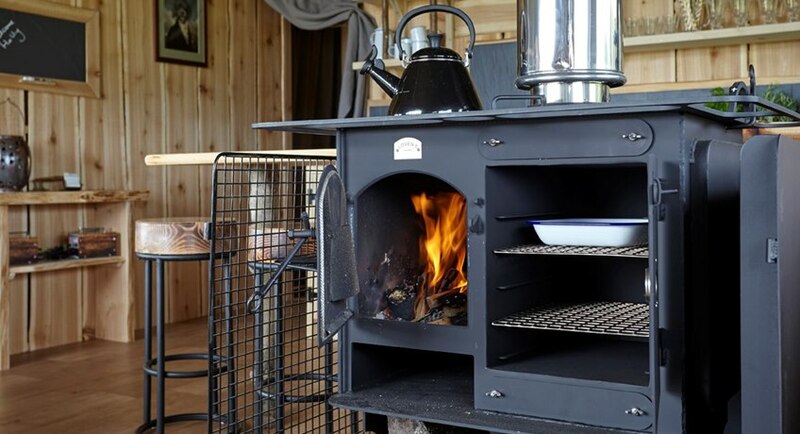 A wood burning stove is in the kitchen along with gas fired hob and standard fridge. The kitchen and furniture is made from 85% of wood sourced from the Isle of Wight. Each tent has its own bathroom and W.C. and even a private outdoor hot shower, plus a separate washroom and WC. 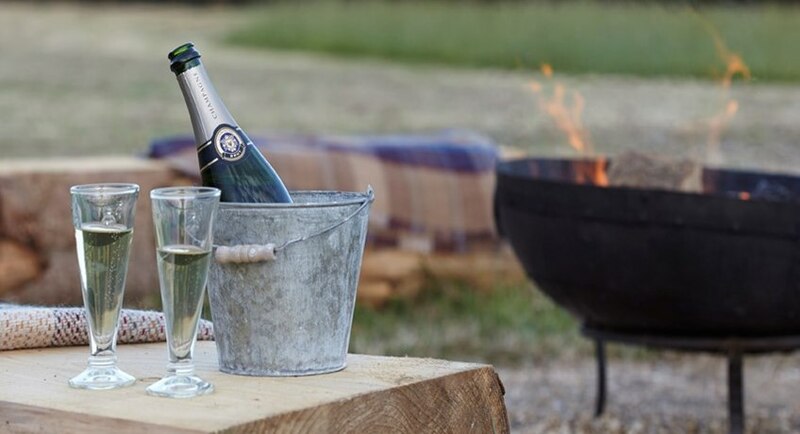 The four safari tents have solar lighting and USB points (there are no plug in points or Wi-Fi), Kadai fire bowls and BBQ with tripod and bike and wellie racks. 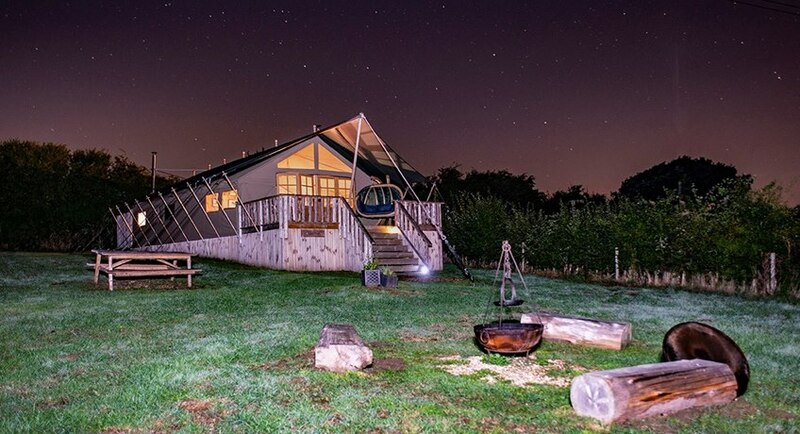 Glamping the Wight Way is pet free and vehicle free (with a private carpark close by). Group bookings are welcome but do not accept stag and hen type parties. Bed linen and towels included. Children of all ages welcome. All wood, briquettes and firelighters are included. A starter bag of lump wood charcoal is supplied for use on the Kadai BBQ. Open: 1 April - 4 November 2019 | Minimum number of nights: 3 nights starting on a Friday. 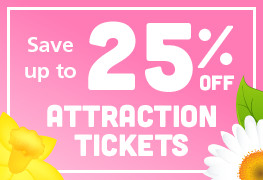 Between 19-25 April, 3 - 9 & 24-30 May 2019 it's 3 nights starting on a Monday. 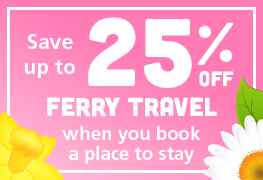 4 nights starting on a Monday or a friday if during special offer period. 7 nights starting on a Friday or Saturday except between 12 July - 8 September when it's Friday arrival only. Wind up lanterns, torches and solar powered lights inside and out. Wood burner heater in the bathroom and wood burning stove in the kitchen. Cot, step, toddler loo seat, highchair and safety rails available on request. Cars are not allowed onto the meadows. A returnable security deposit of £200 per tent booked is required directly with Glamping the Wight Way prior to arrival date.